Joe Root admits he was not prepared for the full extent of off-field challenges associated with captaining England on this Ashes tour. Root, on his first overseas trip as England’s Test captain, has been peppered with more questions about the team’s conduct and curfew than their cricket. The tone was set by Ben Stokes’s brawl outside a Bristol bar in September that left another man with a fractured eye socket. Recent alcohol-fuelled antics involving Jonny Bairstow and Ben Duckett have entrenched a reputation that England have a booze problem. The latest episode, in which England A batsman Duckett poured a drink on the head of Test spearhead Jimmy Anderson, has prompted coach Trevor Bayliss to all but declare publicly that careers are at stake. It has also overshadowed Root’s attempt to artificially create confidence as the tourists seek to stay alive in the five-Test series by avoiding defeat in the WACA Test that starts tomorrow. “I knew it would be challenging, and I knew there would be stuff around the cricket – but not to this extent,” Root told reporters. “I’m fed up of talking about stuff that’s not cricket. “I don’t know how I’ve still got all my hair… I can completely see how captaincy can take its toll. Root added “the lads have to wake up and smarten up”. “It’s been frustrating… very frustrating,” he said. Root’s team trail 2-0 in the series, having been competitive in patches but ultimately fallen to heavy defeats in Brisbane and Adelaide. Only one team in Ashes history has fought back from such a position and won the series: Don Bradman’s Australia in 1936/37 on home soil. Anderson, who is set to become one half of the most prolific new-ball pairing in Test history when he lines up alongside Stuart Broad in Perth, found his mojo under lights during Australia’s second innings of the day-night Test. But after grabbing his maiden five-wicket haul in Australia, 35-year-old Anderson was among England’s Test players enjoying a night out after director of cricket Andrew Strauss agreed to a temporary relaxing of the squad’s curfew. Anderson, acting vice-captain in the absence of Stokes, had a drink poured on him after returning to the same bar where Bairstow headbutted Cameron Bancroft during England’s first night on tour. “Yes, maybe a little bit,” Root said, when asked if England’s all-time leading wicket-taker should perhaps be setting a better example. Meanwhile, former England captain Alastair Cook insists he has no plans to retire any time soon, but admits he needs to start scoring some runs to keep the wolves at bay. Australian paceman Mitchell Johnson and former Test star Kevin Pietersen have both indicated in recent days that Cook’s body language and unconvincing start to the Ashes series suggests the veteran is nearing the end of his storied career. England’s leading run-scorer will notch his 150th Test cap in the third Test against Australia starting tomorrow at the WACA Ground. The 32-year-old has averaged just 15.5 runs so far this series, and says he’s desperate for a big score in Perth, where the tourists will relinquish the urn if they lose the Test. Cook is the first to admit he’s not setting the world alight with the bat. But he was quick to hit back at talk from critics like Pietersen and Johnson that he was ready to retire. “For the people who are saying that, they’ve had no contact time with me,” Cook said. “They wouldn’t know the extra nets I’ve been doing behind closed doors. “I was with (my batting coach) yesterday for an hour-and-a-half in the morning, desperate to keep working on my game. “That’s probably not a guy who’s given in. 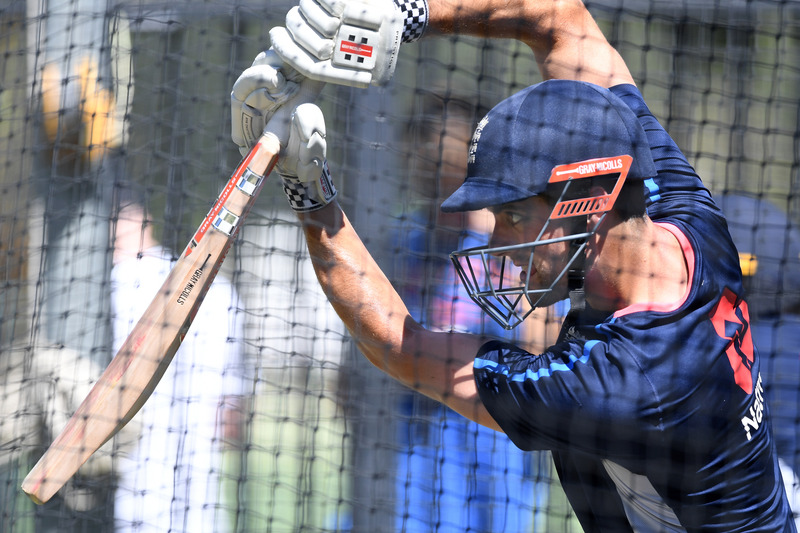 Cook added the caveat that “things change incredibly quickly”, highlighting how he was taught a lesson leading up to the 2014 World Cup in Australia. “In the morning, I was expecting to lead England in the World Cup and, in the afternoon, I got a call saying they didn’t want me to do it,” he said. Cook spoke about the pride he still felt when representing England. But he knows he needs to produce the goods with the bat if he is to hold onto his spot. “If you’re scoring lots of runs all the time, your place is guaranteed,” Cook said. “If you’re not scoring runs, there’s other talented people who want your place. “That hasn’t changed for 12 years, and it won’t change for the next 20-odd years. Former England captains Nasser Hussain and Michael Vaughan are backing Cook to get out of his slump. Hussain said if he wanted an England player to bat for his life, it would be Cook. And Vaughan is confident Cook can work his way back into good form, and possibly play on until the 2019 Ashes in England.